"Become aware of multiple sounds in the house ..."
Become aware of a baby's cry, ringing alarm clock, door buzzer or oven timer. Whatever the noise, the Medallion Series Sound Monitor alerts you to it. 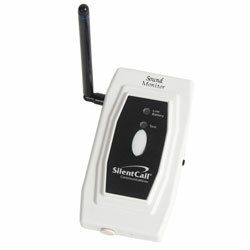 When a sound is detected, it sends a signal to any Medallion Series Mini Receiver. A delay circuit prevents activation by brief noises such as a slamming car door, and a sensitivity switch lets you adjust the sound threshold at which it activates. Additionally, you can set the alerting unit to detect any of three specific sounds if desired: a baby's cry, telephone or doorbell. Fully portable, this alerting device operates on two AA batteries.